Canada recognizes Israel’s right to protect its citizens from terrorist attacks, including through the restriction of access to its territory, and by building a barrier on its own territory for security purposes. However, Canada opposes Israel’s construction of the barrier inside the West Bank and East Jerusalem which are occupied territories. This construction is contrary to international law under the Fourth Geneva Convention. Canada not only opposes Israel’s construction of a barrier extending into the occupied territories, but also expropriations and the demolition of houses and economic infrastructure carried out for this purpose. After months of careful consideration by at least seven CFIA analysts, including five specialists and a senior compliance officer, CFIA staff properly concluded that the wines violated Canadian law and that Dr. Kattenburg’s complaint was well-founded. The CFIA then instructed the Liquor Control Board of Ontario (LCBO) to remove the wines from the shelves of LCBO vendors until a proper action plan for rectifying the false labels had been formulated and implemented. On July 12, 2017 – before Dr. Kattenburg himself was apprised of the CFIA’s decision – the main pro-Israel lobby groups in Canada somehow learned of the CFIA’s ‘disturbing’ decision and intensely lobbied the Canadian government to reverse it. They relied on article 1.4.1b of the Canada-Israel Free Trade Agreement (CIFTA), an obscure provision that has nothing to do with product labelling. Nonetheless, the Canadian government quickly capitulated to the lobby’s demands and pressured the CFIA’s president into reversing his staff’s carefully considered decision. Less than 24 hours after the lobby attacked the CFIA’s decision, the CFIA announced that it had reversed itself on the basis of “further clarification” of article 1.4.1(b), which CFIA staff had already considered before rendering its initial decision that the labels on these settlement wines violated Canadian law. Canada’s pro-Israel lobby was aided in its efforts to circumvent Canadian law by Liberal MP Michael Levitt, the Chair of the Canada-Israel Interparliamentary Group. On the day of the CFIA’s self-reversal, Levitt issued a statement in which he boasted about his advocacy for Israel and professed to have been “shocked and deeply concerned” by the CFIA’s enforcement of Canadian law. Shortly after the CFIA’s lightening-speed self-reversal, the Centre for Israel and Jewish Affairs and Michael Levitt celebrated their victory for injustice by travelling to the illegal Psagot settlement in the West Bank and visiting one of the wineries that is the subject of Dr. Kattenburg’s complaint. In October 2017, I commenced a judicial review application in the Federal Court of Canada on Dr. Kattenburg’s behalf. 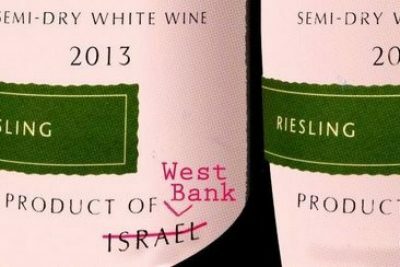 Dr. Kattenburg is asking the court to declare unlawful the CFIA’s decision to allow these wines to be sold in Canada bearing false “Product of Israel” labels. Dr. Kattenburg’s application is scheduled to be heard in the Toronto courthouse of the Federal Court on May 21 and 22, 2019. On November 2, 2018, I filed with the Federal Court a copy of Dr. Kattenburg’s Memorandum of Fact and Law in support of his application. A complete copy of the Memorandum can be viewed at the end of this post. Dr. Kattenburg stands to gain nothing from his extraordinary efforts to ensure that the Canadian government enforces Canadian law. As stated in his Memorandum of Fact and Law, he has commenced this legal proceeding “to help ensure respect for Canada’s consumer protection and product labelling laws, to help ensure that he and other Canadian wine consumers be provided truthful and accurate information about the wine products that they purchase and consume, and to ensure both Canada’s and Israel’s respect for international human rights and humanitarian law.” Although I am acting for Dr. Kattenburg on a pro bono basis, this legal proceeding requires him to incur significant expenses. We encourage you to help Dr. Kattemnburg to shoulder these expenses by contributing to his gofundme campaign here. Here is Dr. Kattenburg’s Memorandum of Fact and Law, filed with the Federal Court of Canada on November 2, 2018. Featured image is from the GoFundMe Campaign of Dr. Kattenburg.